We live in the internet-of-things world. Our computers, our watches, appliances, cars, and factory equipment are all connected to networks. Even lawn watering systems and roadways are upgraded with digital sensors. Number of connected devices has surged nearly 70 percent to 6.4 billion and is growing rapidly. The upside of the internet of things is that people and systems -- healthcare, food production, transportation, energy consumption, investing -- will be smarter and more efficient. The downside - cybercrime. Cybercrime, which is any criminal activity that involves the Internet, a computer or computer technology, has become an unwieldy epidemic that comes in many shapes and forms. The following offers a primer of cybercrime activity and an array of tips for helping you protect yourself and your identity from the bad guys. As an advisor, protecting clients' personal and financial data is of the utmost importance. Don't hesitate to contact me if you have questions or concerns about the best ways to protect your sensitive information. Take a few moments to check out these YouTube videos (both are less than 3 minutes) to learn how you can protect yourself from fraudsters who go phishing. Did you know anyone with an email account is a potential victim to an online attack? Or that there are more than 100,000,000 attempted email attacks by cybercriminals every day? The Office of the Director of National Intelligence shows common tricks fraudsters use to try and get you to give up your personal info. Follow some simple do's and don'ts to help you distinguish fake websites and emails from legitimate ones. Phishing attacks are when cybercriminals try to con users into revealing sensitive information or downloading viruses by means of electronic communication. 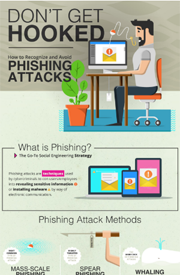 Phishing can take many forms -- be it spear phishing or whaling, smishing or vishing. This visual playbook breaks down various phishing attacks and offers tips to put you on your best defense (Rule #1: Be suspicious, always). One of the best defenses to protect your private information is a strong password. Avoid these common password habits that put you at risk. | MORE: How secure is your password? F ake retail and product apps are swarming Apple's App Store. Some apps are designed to look like the real thing, while others are for companies that don't have official iPhone apps. Either way, the goal is to trick consumers so they give up information that allows fraudsters to access credit cards. Fraudsters are flocking to social media to try and lure users into giving up their login information to PayPal and gain access to funds. Victims of cybercrime pay a high price -- financially and emotionally. Send this email to others in your life who could benefit from its advice.